Commercial Architecture Trends: Indoor Outdoor Theory is some of thought storming and clear ideas about what to be running in coming year. And ahead also, in the design and architectural industries. Here I would like to include some thoughts from the managing director of 3D Architecture Pvt. Ltd. For you to give a wings of your thoughts in Commercial Architecture Trends. Design & Commercial Architecture Trends will in clued classic, contemporary design ideas, traditional and new materials. Fresh decorating colors, exotic motifs, ethnic decoration patterns, artistic details and a surprising blend of textures. The modern contemporary architectural style is fast emerging in India and this category will be of significance for Indian corporate. It serves as a bridge between modernism and post-modernism. And is driven by Eco-sustainability. Implementing new materials and new technologies to provide a better quality of life at your workplace. Commercial Architecture Trends will aid in promoting a sustainable approach towards construction. That appreciates and develops smart growth. Architectural tradition and classical design check in Design Elements of Colonial Style from A Georgian Era. Commercial Architecture Trends in India. This is leading to an emerging Commercial Architecture Trends based on the response to these criteria. The following Commercial Architecture Trends are the ones to look out for. Including plants at corporate houses can greatly enhance the natural ambiance. Plants not only look nice, but they also release oxygen into the air. And some of them can actually filter some pollutants out of the air (spider plants are said to do this). Maintaining an indoor outdoor feeling with large glass areas looking out onto a patio. That can do wonders to an otherwise confining space. Learn about Rule Of Three – How to Incorporate it into Design and Architecture. Given the nature of today’s work processes. Top firms are redesigning their offices to encourage interaction, creativity and spontaneous collaboration. The 21st century design responds to employee needs. For personalized and individually controlled spaces, dynamic technology requirements, and changing business models. The hospitality and retail Industries are experiencing a shift toward entertainment interiors, Or `experience design.’ This new year will foresee the advent of new technology and architecture. Adapted by corporate houses as they are now becoming aware of the importance of having a dynamic structure. Characterized mostly by glass facades, ornamentation and modular designs. The forthcoming year will bring in Building Information Modelling (BIM), color patterns, environmental awareness. Improvement in commercial workspace and resolutions and improvements around the office. Concerns with the ozone layer, global warming, acid rain, diminishing rain-forests and the depletion of vital resources. And the ever increasing demand for energy, has meant that the ecology and the environment. That are rapidly becoming one of the most powerful influences on the design process. The boundaries between indoors and outdoors are becoming less obvious. This can be achieved by opening the facade of a building up to the outside environment. Merging an indoor space seamlessly with an outdoor area. Or by incorporating vibrant colors and natural textures into an interior space. To give the sense of being outdoors. The exterior aesthetics has gained more importance than the interior functionality. The new Commercial Architecture Trends adapted is converting flat glass to shapes that allows `free form’ surfaces. With geometric complexity and the possibility of integrating other elements like LEDs. Into conventional flat glass which gives a long lasting impression in the minds of people and thereby, creates the project as a symbol. The designing system has undergone a diverse change and creates the total design. Along with functional and aesthetic aspects of the interior and the exterior of the commercial buildings. A need to explore how nature can reach no bounds of imagination. Or reality has made landscape architecture today. An integral part of one’s lifestyle at home or at work. The trend though new, will be fast catching up pace in showcasing a glamorous look for the commercial building and the offices. Ornamentation will be the next big trend to give the commercial offices a pristine new look. 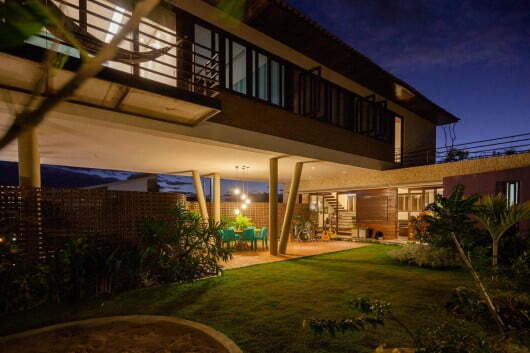 All the changes and wants for the external beauty of the structure have made architecture. The commercial graphic art of decoration. Green walls, bio-walls, hydroponics, green roofs, podium gardens, land bridges, are the new terms in the landscape dictionary. That show the transition from hills, rivers and the horizon, to sky being the limit in the urban landscape. The industry needs an influx of inspired, innovative architectural designs that will work to give cities and communities physical shape to our evolving goals of environmental care. Prefabrication is making a strong comeback in both, residential and commercial architecture trends, as the benefits of greener and faster production techniques become more attractive to firms looking to cut building and operating costs. With modular construction, units can be stacked and arranged into aesthetically pleasing, functional designs that convey an Eco-conscious mentality . Clean lines, aluminum paneling and energy-efficient glass, give modular buildings a modern chic look that will soon populate downtown corridors the world over. Thermal comfort is created through the right combination of temperature, airflow and humidity. A combination of these elements is required for physical comfort at the workplace. Incorporating thermal comfort in office areas definitely bequeaths the workplace with better airflow. Another noteworthy trend in modern contemporary architecture is to significantly reduce the impact of congestion, through intelligent structural engineering and environmentally friendly design. The office should be designed keeping in mind the penetration of maximizing sunlight. Access to nature, views and the presence of daylight and windows, opportunities for active and passive contact with nature, sensory change and variability, will all positively impact well-being. So, friends this is all i have to share here commercial architecture trends in India and around us with their impacts and effects for the betterment and further steps of Architecture industries. If you have any treads in this conversion for our fellow designers, please just put in bellow comments or you can write to me also. Hope you people enjoy the commercial architecture trends of future.